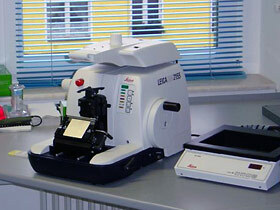 For histological examinations 4-5µm thick sections are prepared of paraffin-embedded biopsies by cutting with the rotary microtome. For each staining procedure on one slide are placed between 3-8 serial sections. Routine diagnostics includes always HE, PAS and Elastica v. Weigert staining. The staining of specimens, with the exception of special stainings, is always carried out in the staining machines. Special staining for amyloid (Congo red), calcium (v. Kossa), acid mucosubstances (Alcian Blue) and iron (Prussian Blue reaction) will be added in clinically suspected cases or on request of submitting physician. All histological examinations are performed by medical director Prof. Gross, which was over many years Director of Institute of Pathology of CBF. Histological examination in IKDT lab follows Dallas criteria for exclusion of acute or active myocarditis in examined biopsy sample. Main focus is oriented on detection of myocytolysis in combination with leukocyctic infiltrates. Observations are fixed as paperwork and as digitally printed colour-photographs which are saved and stored on the data server as TIF-files or JPG-Files. Morphologic characteristics of stained endomyocardial tissue (e.g. diameter of cardiomyocytes, size and quality of biopsy, fibrosis, fatty tissue, capillaries) are rated by numeric scaling and the corresponding values are fixed on written examination protocol and in the electronic IKDT database.